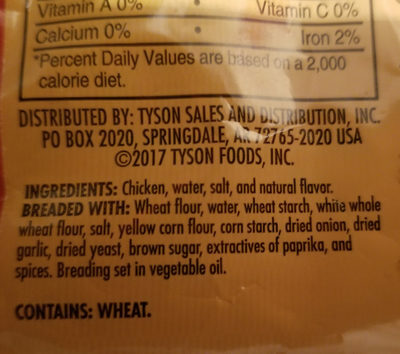 INGREDIENTS: Chicken, water, salt, and natural flavor. 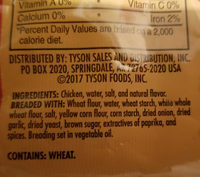 BREADED WITH: Wheat flour, water, wheat starch, white whole wheat flour, salt, yellow corn flour, corn starch, dried onion, dried garlic, dried yeast, brown sugar, extractives of paprika, and spices. Breading set in vegetable oil. 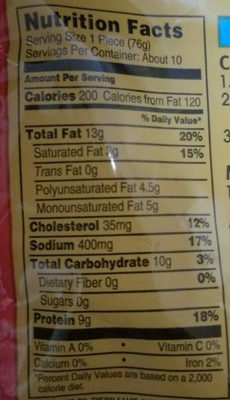 CONTAINS: WHEAT. 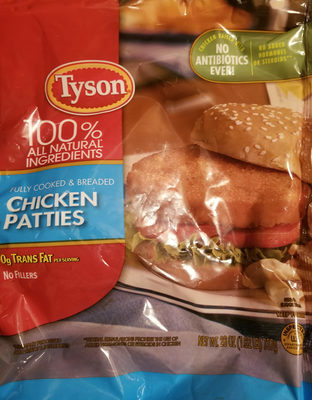 Product added on January 18, 2019 at 8:35:50 PM CET by openfoodfacts-contributors. Last edit of product page on January 18, 2019 at 8:40:26 PM CET by .